Multimedia exhibition “Kinderen van de Hoop” (“Children of Hope”), in the Library 'VANnU' in Roosendaal, Holland. B&W portraits and selection of color photos from photobook “Kinderen van de Hoop” (“Children of Hope”) See: “Spotlight on”. Multimedia installation “Open Eye – Open I; The Battle after Terror”: photos rehabilitation-process survivor suicide-attack, video-animation & poetry Click here. Screening documentaries: “open Eye – open I” and “At the Dream’s Edge”. Collage Israel 1991-2002, and photos of Israeli and Palestinian youth in Tel Aviv & Jaffo/Israel and Bethlehem/Palestinian Authority See: “Spotlight on”. Read an article about this exhibition here. 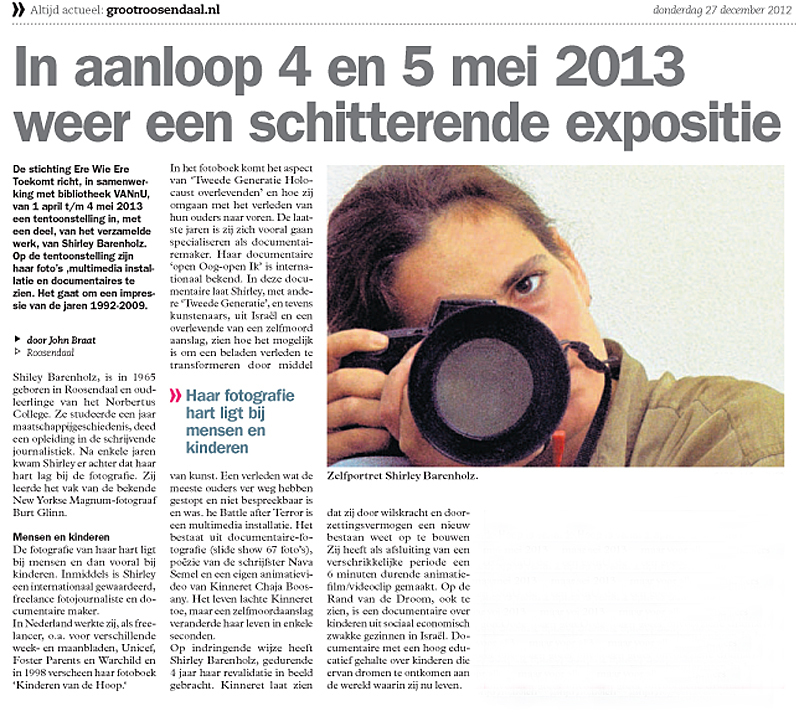 Group-exhibition for 60 year Cefina; contributed with photos of Dutch Haboniem-youth in Israel. “frighten(ed)” - project-week on terror at Ifa-gallery (Institute for Foreign Affairs) in Berlin, Germany. Multi-media installation ‘Open Eye – Open I’ (the Battle after Terror): photos rehabilitation-process survivor suicide-attack, video-animation and poetry. Documentary photography from Israel, Sinai, Bolivia. B&W portraits from photo-book 'Kinderen van de Hoop' ('Children of Hope') & collage 'Israel & Palistinian Authority 1991-2002'. Photos Israel & Israelis abroad, among work from different Israeli & Arab artists. B&W portraits and selection of color photos from photo-book 'Kinderen van de Hoop' ('Children of Hope').